Having developed an incredibly successful suite of adaptations, crocodilians have remained relatively unchanged over the last 200 million years. Saltwater crocodiles (Crocodylus porosus) are the largest of 23 living species and function as apex predators in the ecosystems in which they live. Crocodilians use several common aquatic adaptations to thrive in these habitats; however, it's their unique adaptations, including impressive jaws and integumentary skin organs, that have allowed them to dominate their habitats for so long. Saltwater crocodiles are not the only animals that have adapted to a semi-aquatic existence; animals from a variety of lineages exhibit similar adaptations. For example, just as crocodiles have webbed feet that help them to swim, animals as diverse as beavers, ducks and frogs also possess and use webbed feet. The eyes and nostrils of many aquatic animals -- including snakes, frogs and turtles -- are on the dorsal, rather than lateral, surface of the head, just as they are in crocodiles. Finally, just as sea snakes, aquatic lizards and fish have laterally flattened bodies or tails, crocodiles use their flattened tails to propel themselves through the water. When diving underwater, crocodiles seal most of their body’s orifices to keep the water out. Crocodiles have muscular flaps that help them to close their ears and nostrils. Additionally, crocodiles and alligators have a cartilaginous flap attached to the back of the tongue. This flap functions to keep water from entering the animal's lungs or stomach when the mouth is open underwater. With this flap, crocodiles can capture prey while in or under the water. 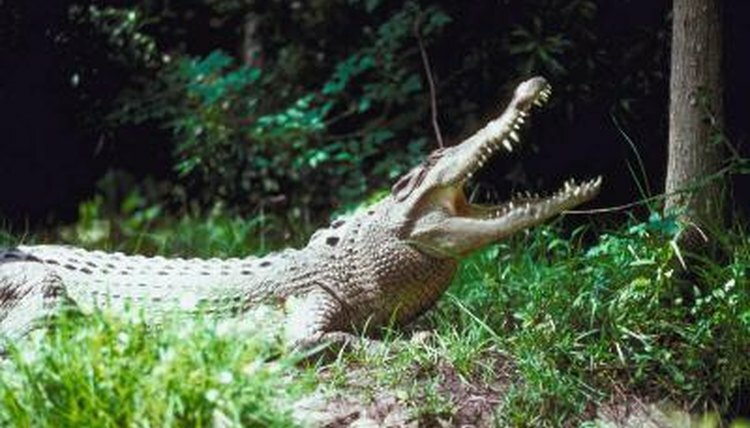 The jaws and teeth of saltwater crocodiles are essential to the survival of the species. Adapted for grasping and crushing prey, crocodiles capture animals as large as buffalos. Equipped with 64 to 68, 3.5-inch-long teeth, few animals escape from the jaws of saltwater crocodiles. Professor Greg Erickson and his colleagues at Florida State University studied the jaw pressure of crocodiles and found that, while most crocodilians were capable of generating largely similar bite forces, the saltwater crocodile generated the strongest bite. The results of the 11-year study, published in a 2012 issue of "PLoS One," show the bite force of these animals to be approximately 3,700 pounds per square inch -- the strongest bite force ever measured. Crocodiles have a number of small skin organs -- called integumentary sensory organs, or ISOs -- on and just behind, their heads. These organs are sensitive to mechanical, thermal and pH stimuli, providing the crocodile with a huge amount of information from a few small receptors. The ability to detect the amount of salt in their water varies among the species of crocodiles. A 2007 study by Kate Jackson and Daniel R. Brooks, published in “Amphibia-Reptilia,” found that saltwater crocodiles possessed ISOs that were sensitive to osmolality. By contrast, a 2013 study of Nile crocodiles (Crocodylus niloticus) -- a species that rarely enters saltwater -- by Nicholoas Di-Poi and Michael C. Milinkovitch, published in “EvoDevo,” found that their ISOs were not sensitive to osmolality. The eyes of crocodiles are exposed to a variety of threats, including struggling prey and submerged sticks and rocks. To protect their eyes, crocodilians possess a third set of eyelids termed nictitating membranes. The nictitating membranes cover the eyes of crocodiles when they dive underwater and are somewhat transparent. While crocodiles cannot see well when their nictitating membranes are closed, they can distinguish light from dark. How Does an Alligator Hiss?